This book is a wonderful collection of articles from some of the best Focusing teachers in the world. This anthology was first developed to teach Focusing to teachers. Now it is being requested by Focusing trainers and coordinators all over the world. Thanks to new developments in publishing, we are able to make this new edition available as a general training resource at a greatly reduced price. 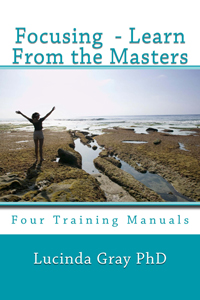 The anthology is divided into 4 manuals which can easily be used in a training program. The manuals include short exercises that help you get the feel of Focusing. We find Focusing to be the most powerful change process we have ever encountered, and we hope you enjoy the collection as much as we do. The author is available for consultation at no charge to teachers who want to use this book in any training program.